If you’re looking for used office cubicles that are affordable, yet attractive and well made, turn to Reimagine Office Furnishings (ROF). Since 1991, ROF has supplied new, used, and refurbished/remanufactured office cubicles from leading manufacturers to small and large businesses alike at only a fraction of the cost. Our new cubicles are always competitively priced, but when you buy used cubicles from ROF, you can save up 80 percent off the original manufacturer’s price. This is an especially amazing deal since we offer cubicles crafted from leading manufacturers such as HON, Steelcase, Herman Miller, Indiana Furniture, and Allsteel, companies that are known for expertly crafting fine furniture. What’s more, our in-house refurbishment team would be happy to slightly customize the cubicles you buy by modifying the color of the cubicle panels to suit your liking and your office’s existing décor. 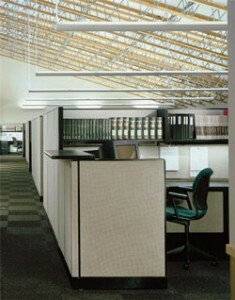 For more information on buying used office cubicles from Reimagine Office Furnishings, contact us today. We will gladly provide you with a free, no-obligation quote and answer any questions you may have.